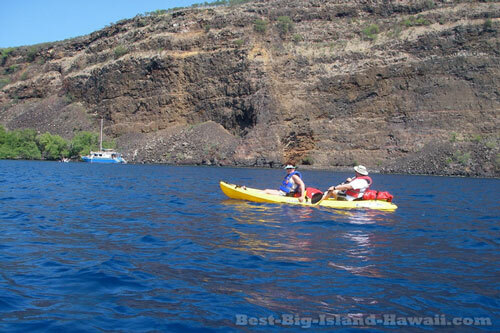 Kealakekua Bay and its surroundings make up one of the most beautiful areas on the Big Island of Hawaii. The town is just a short 10 minute drive from downtown Kailua-Kona on Highway 11 and the bay is just a little bit further. Historically, the bay is famous for being the place where the British explorer Captain James Cook met his end in a confrontation with some local Hawaiians in 1779 with his ship, the Resolution, anchored nearby. The town of Captain Cook is named for him and a monument near the shore marks the spot where he died. Today, the area is most famous as an incredible destination for kayaking, snorkeling, and watching for whales and dolphins. At 500 feet deep, the bay's sheltered blue waters are the perfect place to enjoy the ocean. Learn more about how to access this snorkeling spot (one of the best in the whole state of Hawaii!) on our Snorkeling Page. Even if you're not going for the snorkeling or kayaking, the area is a nice place to check out on a half day road trip. 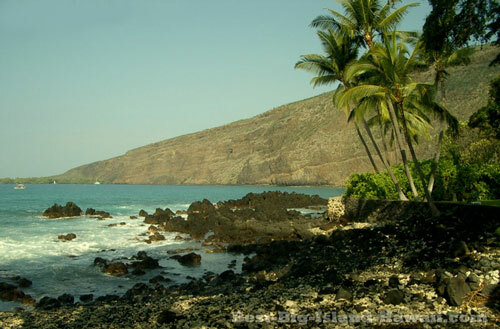 As you head south from Kona, Kealakekua is one of a series of small towns you pass through that sit at about 1,000 feet of elevation before you get further into the middle of nowhere on the way to round the bottom of the Island near South Point. 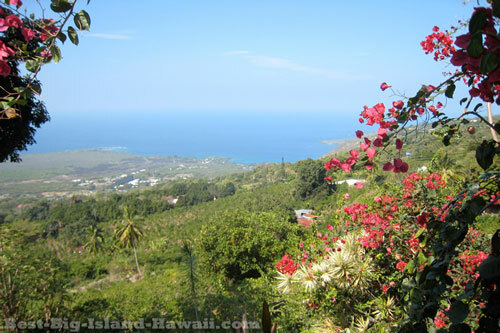 The area is also where some of the best Kona Coffee is grown and there are several places to check out coffee production and, of course, to taste some great local coffee. Learn more about Kona Coffee and how to get the real thing by checking out our Kona Coffee Page. Head all the way past the town of Captain Cook in the morning or early afternoon and check out The Coffee Shack restaurant where they serve some excellent eggs for breakfast and great sandwiches for lunch. They also serve Kona Coffee made from beans grown right at their location. The Eggs Benedict and cinnamon rolls are not to be missed. This is definitely a required stop on any visit to Kealakekua Bay. What more could you ask for than a great cup of coffee, a fresh cinnamon role and a view of the bay from your table? A little further down the road and you'll get to Kealakekua Bay itself. There are several private homes on the bay but there's also two park areas and the kayak launch area where you can enjoy the view on the ocean shore. Humpback whales and spinner dolphins often visit the deep calm waters here and, if you're lucky, you might even get the chance to see them breaching the surface of the bay (bring your binoculars… and your patience). 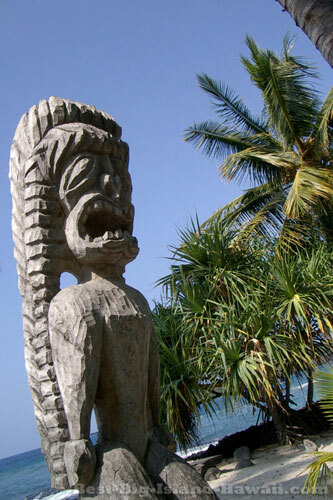 From the bay, Highway 160 turns south and continues 3.5 miles to the town of Honaunau where you can check out the Pu`uhonua O Hōnaunau National Historical Park (also known as the Place of Refuge). For the ancient Hawaiians, the Place of Refuge was where someone who had broken the law could flee to escape punishment by death. Pu`uhonua O Hōnaunau National Historical Park is like a large open air museum and great place to learn about Hawaiian culture. 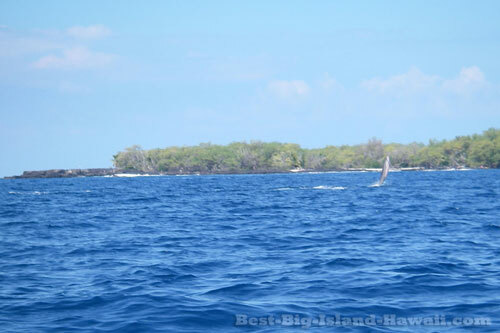 With great food, coffee and things to see, a visit to the area around Kealakekua Bay makes an excellent half day trip from Kona. Get in the car, roll down the windows and take your time exploring this beautiful area of the Big Island.